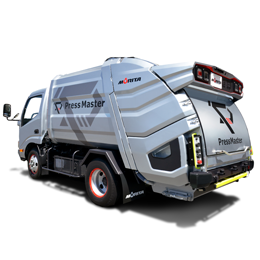 Pack Master PA7 is an innovative refuse vehicle that improves the efficiency, physical labor and safety of collecting garbage on narrow streets. It incorporates a powerful press into a compact body only 1,850 mm wide. PA7 is designed ergonomically. It features a hopper door that can be opened/closed easily with one hand, and a low loading bay only 700 mm off the ground. The rear of the truck features a taillight/indicator cluster that is raised off the body above the hopper door, to make it easily visible to pedestrians and other vehicles.